Twister, a trailer park themed slot released by Microgaming, comes with 15 lines, several bonus features, and a top jackpot of 15,000 coins. 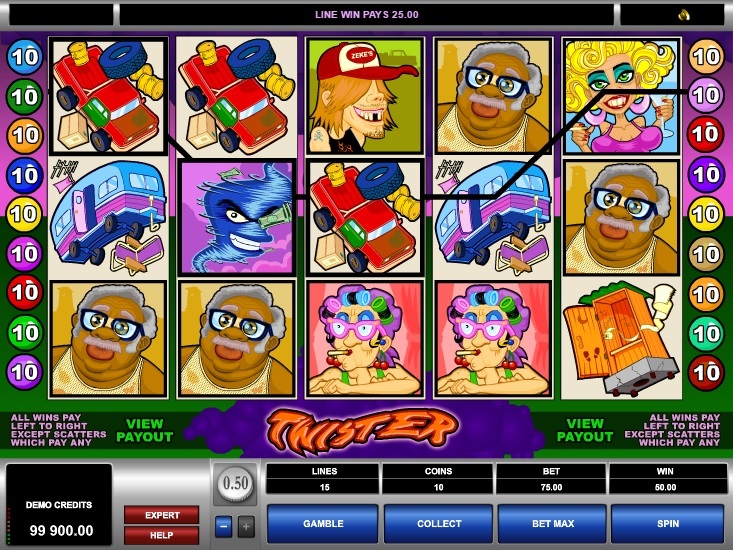 Twister slot comes with 15 paylines, and before playing the game, players are required to activate as many or as few paylines as they would like to play. Players can then bet up to 10 coins per active payline. The coin values range from $0.01 to $0.50, which means that players can bet as little as $0.01 to as much as $75.00. The game has two modes—the regular mode and the expert mode. While the regular mode lacks advanced features, the expert mode comes with advanced features such as Autoplay, which allows players to spin the reels automatically for as many games as they wish. Twister is based on the theme of a trailer park, featuring symbols of outhouses and pick-up trucks and amusing characters. The graphics are brilliant, making this slot a pleasure to play. The reels are populated with regular symbols of Laverne, Zeke, Suzanne, Kwik-Mart, Buba, trucks, mobile homes, and outhouses. The Twister symbol acts as the wild, so players can use it to complete winning combinations and grab extra payouts. The wild symbol, however, cannot substitute for the scatter to help players activate the free spins bonus round. The Twister symbol also helps players win the top fixed jackpot of 15,000 coins. Players can take home this jackpot if they spin a combination of 5 Twister symbols along an active payline. The Breaking News symbol is the scatter, and players can win some juicy scatter payouts if they land at least two scatters on the reels. If players land a combination of 2, 3, 4, or 5 scatter symbols along an active payline, they can win nice scatter payouts of x1, x2, x20, and x60, respectively. A combination of three Breaking News scatter symbols anywhere on the reels triggers the free spins feature. The free spins round comprises 20 free spins with doubled wins. Players can re-activate this feature during the free spins, winning 20 more free spins with doubled wins. The slot comes with an optional gamble feature, which players can activate at the end of every win. This feature challenges players to double their wins by guessing the correct color of the face-down card on the screen. If they make a wrong guess, they will lose their winnings. Players can win up to 10,000 coins in the gamble feature.